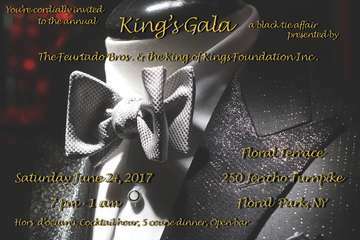 The King of Kings Foundation, Inc. is hosting It's 5th Annual Black Tie Affair "Kings Gala" Fundraiser to Help support our Positive Impact Movement Mentoring Program (P.I.M), our community events which are in line with our Goals of Helping to Build "Stronger", "Safer", Closer" Communities and to underwrite other operational costs associated with our organization. Our goal is to raise $100,000 so that we may enhance and expand our efforts. The King's Gala will take place on Saturday June 30th 2018, from 7pm - 1am at The Beautiful Floral Terrace located at: 250 Jericho Turnpike Floral Park, New York. 11001 The evening will consist of "Meet & Greet", "Red Carpet", "Cocktail Hour Full Buffet","Dinner", "Music", "Raffles", "Open Bar All Night" TOP SHELF EVERYTHING and "Surprise Guest Celebrities". We are expecting over 400 guests and hope that you can be one of them. So, join us for an evening of fine dining, entertainment, and fundraising! Remember, all donations made to the King of Kings Foundation, Inc. including the price of the ticket are 100% tax-deductible, so keep your receipts!